i shared some information about MyChelle skincare system with you, but i was also sent RoC's newest product you may have seen on aisle endcaps at your local Target. this is RoC's newest product, the RETINOL CORREXION Max Wrinkle Resurfacing System. this new system is a two step kit that is clinically proven to be up to 4x more effective than a series of three dermatologist peels. sounds pretty good, right? so how do you incorporate this into your regular routine? one thing i like to do is to occassionally mix up my products so that my skin doesn't settle. 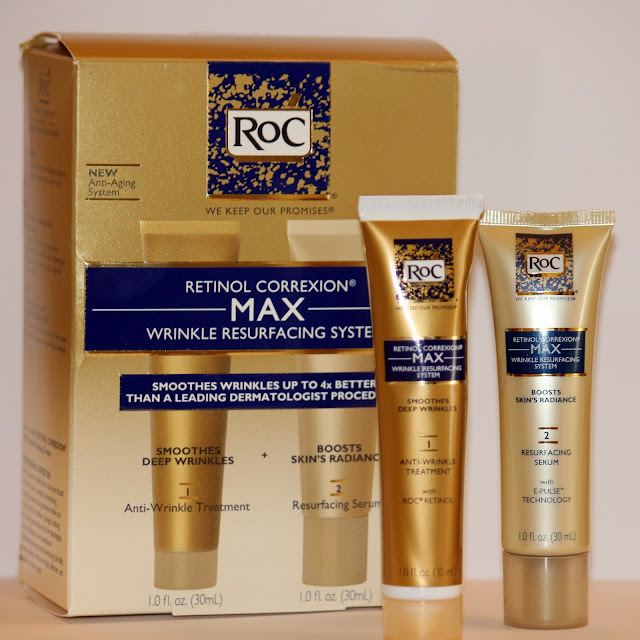 the RoC products would be a great option for an intense 4-6 week treatment, take a few weeks off, and then continue again. if the more expensive product lines aren't something you can afford, this duo for $26.99 is a reasonable (if not great) price to pay for an effective skincare program. looking for improvement in those areas? then go ahead and give these products a try. Roc is from France and I trust this brand because my mom used it when I was little. I don't know if the one sold in the US is the same but the French ones smell great! I can't find the hydrating cream they have there and I've been wanting to try the ones they have for around the eyes. The problem is that I'm afraid it might dry out my skin or irritate it if I go in the sun. I didn't buy anything yet because I wanted to ask you first about it (you're the expert!) I can never remember which ingredients are the ones that can irritate skin before making it better and which ones make it worse under the sun. I would love to hear your advice on this and also hear what is the best cream for around the eyes for someone who has sensitive skin (saw that Aveeno has something now but don't know if it's effective) Thanks! Thanks for a quick and informative review. I'm also looking for an anti-aging treatment for my mom. I want to know if this product has the same features like MicrodermMD? Because I'm looking for a skin care product that can deal wrinkles in a less time. Well I guess it's not bad to try this product also for compassion with other anti-aging and wrinkle removal treatment creams.